Sometimes you see a concept in a watch that is a little different from the normal. And even though this idea has been around for along time, this particular model strikes a chord with me I suppose as it has the small button compass, which is far easier to hold in your hand than on your wrist. 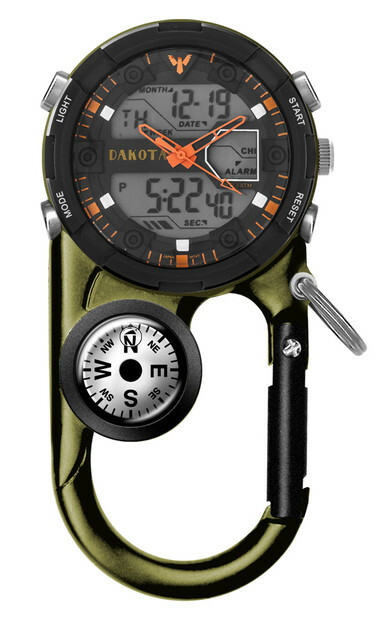 This is the Dakota Watch Men’s Green Angler 11 Ana-Digi Clip watch, which is quite a mouthful to say but actually quite a neat device. The idea here is to “clip” this little item to your belt or pack or whatever is to hand when trekking or hill walking etc. The watch itself is pretty decent and with a good set of features and a great “not on your wrist” size at 48 mm x 48 mm x 18 mm, which is just about ideal for what essentially is a hand held unit. The speedy carabiner clip is a snap to use – easy off the waist band, hold in left hand horizontally (no twisting of the wrist) use the compass level bubble, take your heading and you’re away. Probably every bit as good as any digital compass watch. The movement is Japanese Quartz, no details and features Alarm, Date display, Digital display, Dual Time, and a three hand analog dial layout in black orange. Mineral glass crystal and a Water Resistance of 30 m and the case in made from aluminum and stainless steel. Note the hands are skeletal orange colored and the digital display is well defined in the background and overall looks pretty decent. Four pushers and a Crown and I have to confess I rather like the overall layout as you can see a lot of information at a glance. Analog Time plus seconds, the Day, Date and the Month plus the time digitally with am/pm indication and or Dual Time. It also features a back light. 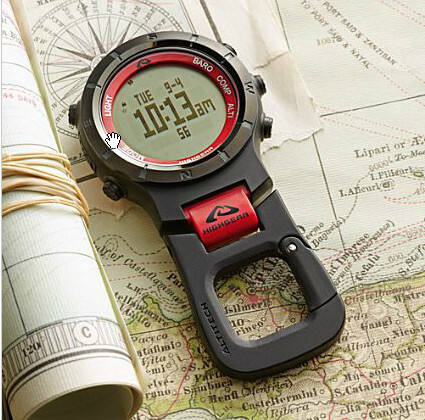 The small and separate liquid filled button compass is just below and affixed to the carabiner and there is also a key ring style ring at the side. 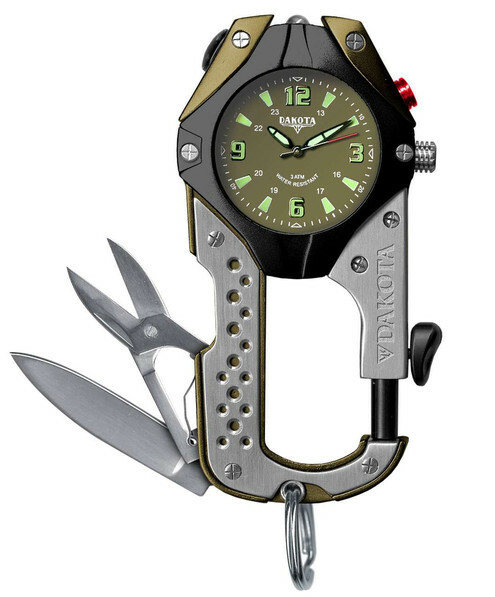 There are I understand around 5 other variants of this, one of which features a knife blade and scissors – see image inset, though the watch dial is not as good in my opinion and the clip is not the classic carabiner. 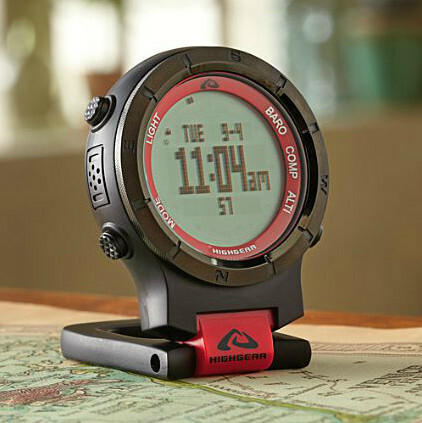 You can apparently get your bearings with this Digital Compass, which also has an Altimeter, Chronograph and Alarms (3) and it even gives you Sunrise and Sunset times – Wow! Must be a backpacker thing – me – I’m too old for all that, but I like it anyway! Things like an 80-log memory for total ascent and descent – does this make sense to you folks? However I particularly like the way it can sit up and be used as a clock, that is really neat. It’s around the same price as the Dakota and as I’ve discovered there are literally dozens of these “clip” watches around – it’s amazing and maybe shows how out of touch I am these days – Ah well . . . . Anyway interesting items and there seems to be no shortage of them, some good and some not so good. These two I quite like as they show a couple of different approaches tech wise in a small way and at the end of the day – you takes your pick!